When it comes to cellular modem connectivity, either for mobiles or laptops, the first companies that come to mind are the traditional players such as Qualcomm, Intel and various other SoC vendors. Between all of these vendors there is one distinction to be made: those who use CEVA IP for their modem designs and those who do not. Of the latter, there’s only Qualcomm and most recently HiSilicon (the in-house modem IP introduced in the K960), whereas most other major players over the last couple of years have used CEVA IP. Samsung, Intel, MediaTek, and various other smaller players are among those who have had modem designs enabled by CEVA DSPs. CEVA was providing a key component in the modem, but vendors still have to do a lot of work and own design into making a complete modem subsystem. Today’s announcement marks a key change for CEVA’s business model, as for the first time we see the introduction of a complete modem platform for licensing. The PentaG platform is thus not only a single piece of IP but rather a collection of solutions that offer flexibility and time to market advantages for the vendors. For a start, the modem IP needs to be able to achieve much higher throughputs into the multi-gigabit range, up to 10 Gbps, and carrier aggregations up to 1GHz. Per-channel carrier bandwidth also increases vastly as we go from 20MHz in LTE to up to 100MHz for sub-6GHz and up to 1GHz for mmWave. URLLC (Ultra-Reliable Low Latency Communications) dictates strict latency requirements which requires the modem IP PHY control layer to be extremely robust and performant. Multi-RAT (Radio access technology) support is a key requirement as the modem IP will also need to provide backwards compatibility to existing standards such as LTE-A. 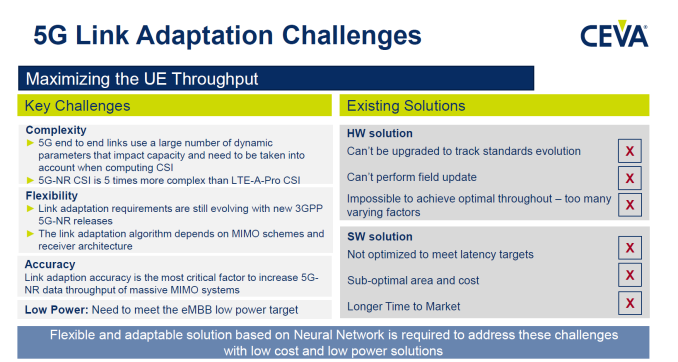 This is particularly important for the first phase of 5G solutions adopting NSA (non-standalone) implementations where initiation is still handled over 4G networks. Full SA (standalone) 5G standards are still being finalised and will be implemented by network operators at later dates. The most important aspect on the radio layer however is the simultaneous operation of both sub-6GHz and mmWave frequencies as the two have fundamentally different characteristics which vastly increases implementation complexity of the modem subsystem. The implementation of the MIMO algorithms and beamforming techniques are one of the aspects that CEVA predicts to be key differentiating factors between modem architecture designs, and will have the most visible effect on user-experience such as connection performance and power usage. 5G link-adaptation is said to be one of the important crucial aspects here, as complexity has exponentially exploded over existing techniques used in LTE-A. Finally, the modem IP needs to be able to evolve with the standard - fixed-function solutions are simply not viable here. In general this is what I’ve heard from a lot of vendors, as everybody is pushing towards SDR (software defined radio) solutions. 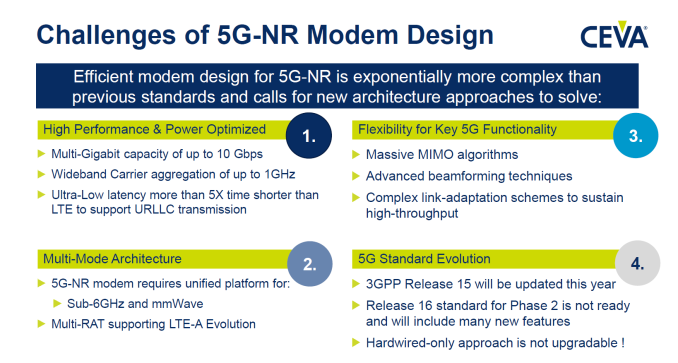 Having an architecture that is both flexible but at the same time extremely performant is a hard task in completing a successful 5G modem design. To solve all of these challenges, and fulfil the requirements, CEVA’s PentaG platform encompasses 5 new key components. On the DSP side we the continued use of a XC4500 which has been the workhorse of many LTE-A designs. CEVA last year introduced the XC12 which promised great improvements over the XC4500, fitting 5G deployments, but CEVA explains that the XC12 is targeted more at base-band station designs where arrays of arrays of the unit are deployed. For eMBB (enhanced mobile broad-band) use-cases, such as smartphones, CEVA explains the XC12 is too power hungry, so they went back to the XC4500 and were able to take advantage of ISA extensions to implement 5G specific improvements. The platform includes a new vector MAC co-processor to enhance the processing capabilities of the baseband module - the added 64MAC units enhance the 64MACs of the XC4500 meaning that as a module the processing power is the same as an XC12. In the graphic above, we see that there are two 5G Baseband Modules forming the XC4500, the MAC co-processor, and the 5G AI processor, which we’ll cover in a bit. The reason for this is again the fundamental differences between sub-6GHz and millimetre-wave frequencies. Dual-operation of both frequency ranges requires two baseband modules working in parallel. In this scenario, the IP does not differ between the modules, however the software and microcode that runs on them will be different. For the PHY control, CEVA recommends a dual-core X2. Everything we’ve talked about till now is strictly limited to the physical layer of the radio modules and the X2 serves as the control flow processors for the subsystem. Vendors here also have the flexibility to choose different solutions, for example Samsung’s LTE modems use CEVA DSPs in tandem with Cortex-R7 processors for the PHY control. As we covered two years ago, ARM has promoted the Cortex-R8 for 5G designs. Finally there’s still need for fixed-function accelerators for signal conditioning, and as such CEVA offers new Polar and LDPC (Low-density parity-check) encoders and decoders which are required for 5G NR. The AI processor in the slide needs a more thorough explanation. The PentaG platform introduces a new neural-network inferencing block whose sole role is acceleration for Link Adaptation. As mentioned, CEVA made a great emphasis on the challenges that 5G NR Link Adaptation brings. Link Adaptation is the mechanism between the UE (user equipment) and the base-station, where the UE chooses the most optimal signal carrier and antenna configuration. For LTE-A, Link Adaptation was still doable in software, however the use of massive MIMO, beamforming, and the vast frequency ranges of 5G NR means that there are more changing parameters when computing CSI (channel state information). Computing the CSI is a complex problem, and there is no simple “right” answer that can be defined by a simple algorithm. If the CSI does not choose the most optimal physical configuration, this can have direct effects on the throughput of MIMO systems, so the CSI needs to be as accurate as possible. 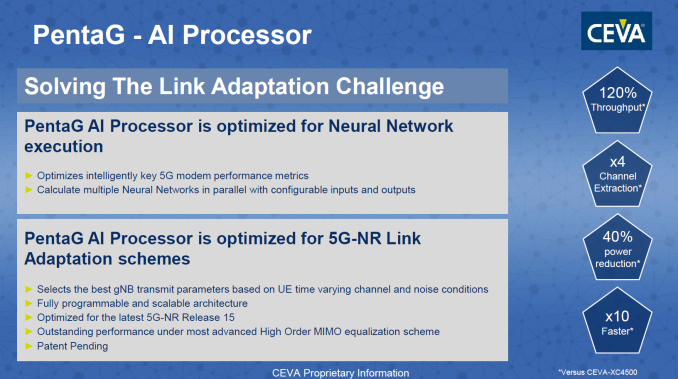 CEVA chose a neural network implementation as it gives the best results at much faster speeds (and lower power) than conventionally processed algorithms, such as traditional database search approaches. I’ve asked if the architecture of the AI processor was in any way related to the newly announced NeuPro NN IP solutions and was told that they have very little in common. 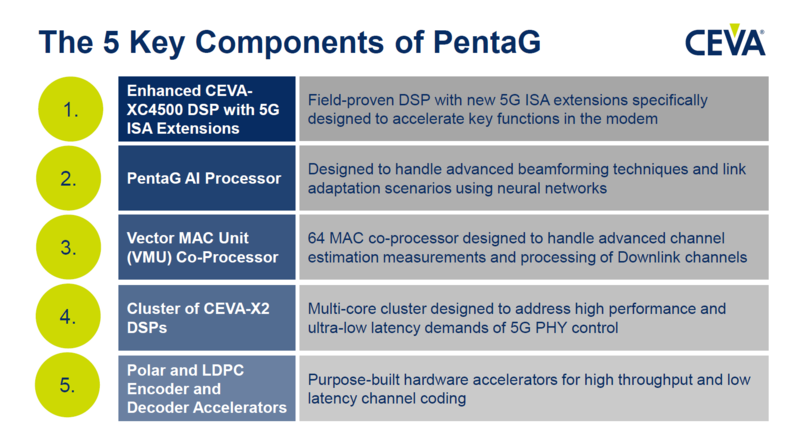 The AI processor in PentaG is designed specifically for the task of Link Adaptation, whereas NeuPro is aimed at general neural networks. Again CEVA was very confident about their advantage in this area and said that this will make an observable difference in end-devices when compared to competitor solutions. What CEVA promises with PentaG is an optimized 'whole solution' that vastly improves time-to-market for licensees. Not every one of the sub-blocks of PentaG is new IP, as blocks such as the XC4500 and the X2 already exist and are implemented in existing modem designs by licensees. The fact that the platform is an evolutionary update means that less work needs to be done by existing licensees, and they can choose and pick what parts of the PentaG platform they want to license for their designs, which again is a new business model for CEVA’s cellular IP offerings. Over the last several years, we have observed CEVA as a key enabler for silicon vendors that design their own modems. As the industry transitions to 5G, the new PentaG offering looks to bolster CEVA’s lead market position further. The PentaG platform is currently available for evaluation by licensees and is aimed to be finalised by mid-year, meaning that we are expected to see silicon solutions at the earliest in mid-2019 to early 2020. The first 5G mobile devices implementing eMBB will be operating at sub-6GHz bands in 2019-2020, with RF front-end solutions for mmWave operation from 2021. 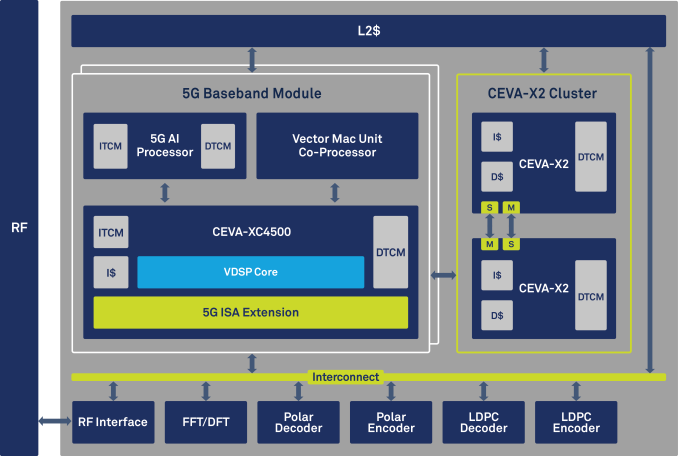 Since all 5G are really built and improved on LTE, I am going to assume this also mean it is CEVA's first full LTE / LTE-A / LTE-A Pro Modem IP solution?